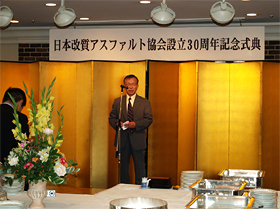 Japan Modified Asphalt Association celebrated 30 years of service with about 50 participants of the former and current JMAA board and committee members at Hotel Heart-In Nogizaka (Tokyo) on September 5, 2008. 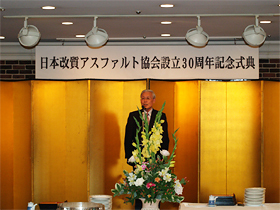 The chairman, Mr. Miyachi told in his greetings that the association was founded as Rubber Asphalt Association in 1978, and the name was changed to the current name in1992. Taking the opportunity of 30th anniversary, we had formulated the JMAA vision to consistently promote the contribution to society. 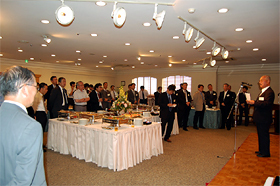 And the policy of acquiring the qualification for a corporate organization was declared. The chairman also said “by setting the vision, we would like to make clear what we were performing”, and “we would like to acquire the qualification for a corporate before the next general meeting in 2009. Past chairmen, board and committee members gathered at the ceremony, which told us a long history of the association.